A fantastic resource for anyone traveling to the islands of Maui, Kaua‘i or the Big Island of Hawai‘i! Tropical breezes, crystal-clear water, white sand beaches and spectacular sunsets. Hawai‘i’s majestic beauty is paradise on earth. Our Hawaii travel guides and visitor magazines can help you plan your vacation to the islands of Maui, Kaua‘i and Hawai‘i (The Big Island). They feature the best tourist information on; where to dine, what activities to do, where to find great shopping, a showcase of spectacular art galleries, the island's top sights and attractions, where the best beaches are and so much more! Each of the Hawaiian islands has their own unique personality, but the Aloha Spirit is everywhere. From the beaches on Maui to the rainforests of Kaua‘i, and the volcanoes on the Big Island! Our travel publications can help you explore, plan, discover and make your trip to the islands of Hawai‘i THE BEST! Our high-quality Hawaii Visitor Magazines and Tourist Guides deliver the location-specific information you need. Our Best Guidebooks provide you with a carefully selected list of island businesses that were chosen for their levels of excellence. These unique series of tourist guidebooks will show you THE BEST that each island has to offer, THE BEST things to taste, experience or to do on the islands of Kauai and Maui. Looking for where to shop or dine in Hawai‘i? What about where and what Hawaiian activities you should do? Or how about where the amazing selection of art galleries there are to check out? Well, our dining, shopping, activities and art magazines will show you show you everything you should do, taste or see when you visit popular Maui destinations like: Lahaina, Kaanapali, Kapalua, Upcountry and the Road To Hana, as well as the South Maui towns of Kihei and Wailea. And, if you are planning a trip to Kauai or the Big Island of Hawai‘i, our elegant dining magazines will be your personal concierge for everything amazing that these islands have to offer. 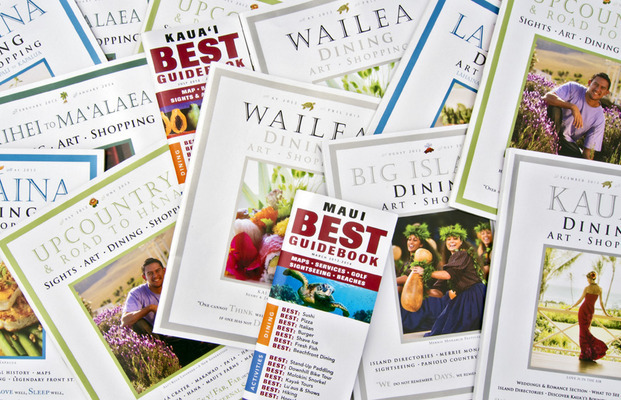 Even local concierge, at all many of the major Maui resorts and hotels, turn to our guidebooks and magazines as an indispensable tool for offering their guests advice on where the best restaurants, boutiques, shops, and fine art galleries are located. Feature editorials focus on island history, Hawaiian lifestyles and guides to unique places to see and things to do while in the islands. Detailed Island maps lead visitors directly to our advertisers. The Hawaiian Islands have a unique art scene that attracts affluent visitors from around the world. We focus on spotlighting artists and galleries in our Art Review Section. Alphabetical directory listings assist visitors in making their dining and shopping choices with informative reviews and at-a-glance information such as hours of operation, location and reservation numbers. Discover THE BEST that each, unique, Hawaiian island has to offer you..